Published March 1, 2017 – Captains Linda and Bob are halfway through their one year sailing trip aboard s/v Argon having left Boston last September. Here is a recap of the last few months as they transited through the Leeward Caribbean Islands from the West Indies to the British, US and Spanish Virgin Islands. They are currently in Turks and Caicos as Argon slowly, and somewhat reluctantly, weaves her way northward over the coming months. 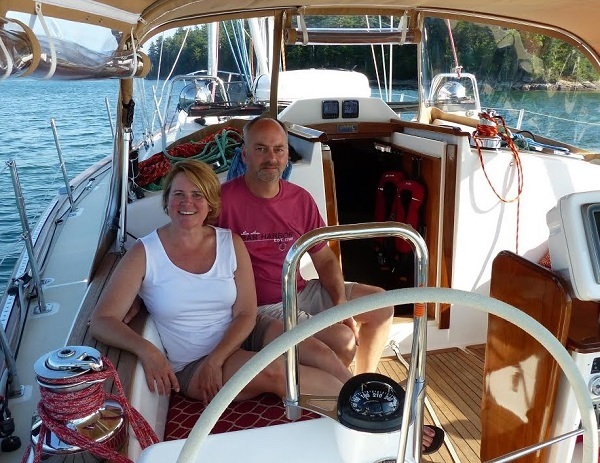 Editor’s note: This is the third installment in a series of dispatches from Linda and Captain Bob Damiano, who are nearly six months into their one-year sailing voyage aboard their Tartan 4000 Argon. What or where the heck is Saba?? This lesser known Leeward Island is about 30 miles west of St. Maarten. And what a gem it is! 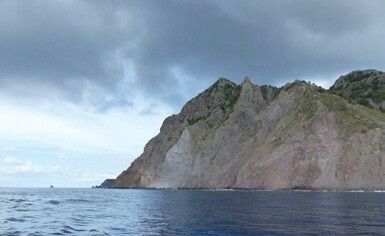 When approaching Saba, one is deceived by scale. 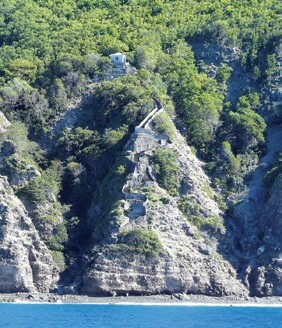 It looks like a small, round island but then you realize that you are still five miles (not 200 yards) out and as you get closer, the sheer cliffs around the perimeter of the island tower above. And on top of those jagged cliffs are some tall and steep mountains…a dormant volcano, actually. Saba looks absolutely uninhabitable from the water (save for the few houses you can see on slopes of the northeast side). And, don’t come here for the beaches – there are none. Well, not usually. Apparently, an occasional beach washes up on the western (leeward) side of the island near “the steps” (more on those later) and remains for a few days to a few weeks. Sabans take advantage of this beach when they can. 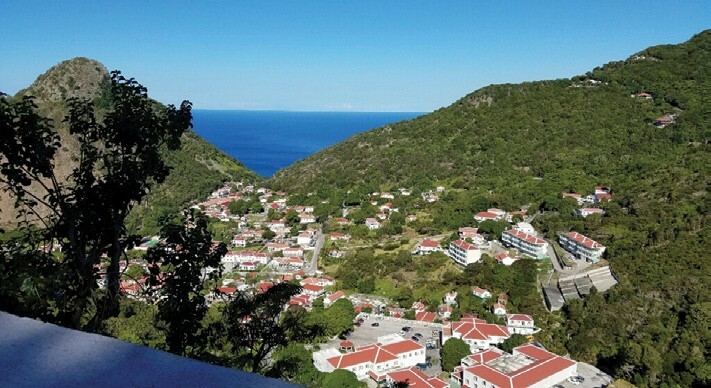 Besides the lovely scenery, villas, hotels and great restaurants, many venture to Saba for the fantastic scuba diving along deep cliffs in crystal clear water. 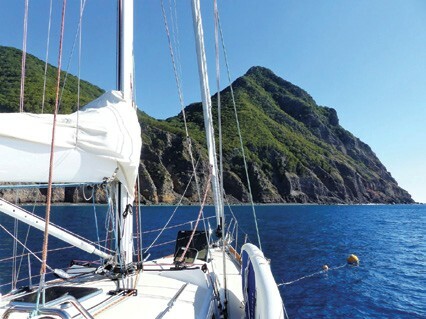 Anchoring is impossible near Saba, as the cliffs continue where the land meets the water. There are only two places to grab a mooring: Well’s Bay on the northwest side and Port Ford pier on the south side. Neither place is especially protected, or to be exact, protected at all. Saba can be a miserable place to sit on a mooring in any sort of weather. We selected a very calm weather window and were perfectly comfortable in both mooring areas. After clearing customs and immigration, there is not much to do right in the immediate area (unless you are into sand mines and junkyards). While passing the harbor on the way to the moorings, we caught a glimpse of one of the settlements up in the hills. It did not look that far away, and we wondered if we would just walk it. Well, it’s not that far in 2D but the Z axis is a killer here. We wandered into Pop’s Place (the only bar near sea level on the entire island) outside of customs and asked about a taxi. Two different taxi drivers happened to be drinking in the bar at the time and we had our ride. (Hey, it’s the Caribbean, mon!…I think the driver who had consumed less alcohol volunteered to drive us.) All four wheels had all lug nuts – a bonus, as we have been in some interestingly maintained vehicles among the islands. Prior to 1950, the only way for people and goods to get on and off Saba was from Well’s Bay (completely exposed) up crazy steep stone steps and with no sort of dock, only a thin strip of rocky, surf-battered shoreline at the base. We wanted to go ashore here but even with our mild conditions, beaching the dinghy was untenable. It is hard to imagine the dangerous conditions that residents must have had to deal with for hundreds of years. 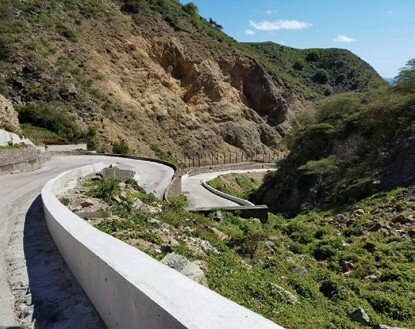 Disclaimer: Any of theses pictures that attempt to capture the insane steepness and height of these roads and structures fail miserably to do so. I suggest you read this while up on a wobbly stepladder standing on one leg. That might help. Today there is a semblance of a harbor (Port Ford on the south side) and an actual road connecting the harbor to the small capital of The Bottom and on to the other town of Windward Side. After quickly ditching ambitions to walk up the mountainside, our driver started up the steep road from the harbor. Very soon you realize the absolute insanity of building this road. Within the first half mile there is an “S” turn that is incredibly steep with very sharp, tight hairpin turns. This road did not exist until the 1950s, and conventional wisdom held that it would be impossible to build a road that could transit this island. Sabans are a very stubborn and proud people and telling them something can’t be done is apparently a sure way of getting it done. A resident named Josephus Lambert “Lambee” Hassell took a correspondence course in Civil Engineering, then designed and led the building of the road that couldn’t be built. Needless to say, he was hero and remains a legend among Sabans. Eventually you get to a somewhat flat area of the island, and it is here that the lower settlement called “The Bottom” is built. The Bottom is situated in the crater of the dormant volcano. By the way, on Wikipedia, Saba’s volcano is classified as “Potentially Dangerous.” It has not erupted since 1640, but in geological time scales, that is like yesterday. Sabans worry about the volcano about as much as Americans worry about Yellowstone. We stopped briefly in The Bottom, but had our taxi take us on up to Windward Side. On the way up, we passed the Saba University School of Medicine (yes, you can go to med school in Saba) and picked up a student who was hitchhiking up the hill so she could watch Sunday night football in one of the bars. Windward Side is the big city of Saba. Here, you will find a few hotels, restaurants and bars, art galleries, museums, churches, markets and the hospital and pharmacy. Windward Side is over 1,300 feet above sea level and about a mile inland from the southern shore. The next day, we hired “Lollipop” a local jack-of-all-trades and lovely woman who not only runs a taxi/tour, but a laundromat, guest houses and student apartments. She also does home visits to take care of an elderly woman on the island. Lollipop is what you call a good person. She acquired her moniker from one of her elderly clients who thought he was “as sweet as a lollipop.” She gave us an excellent tour of the whole length of the road, sharing lots of local trivia and telling us about her family as we went. Later, we ran into her again…in Pop’s Place, of course. We started appreciating how incredibly clean and well maintained everything is on this small island, and we noticed more than one person outside of their home or business with a broom sweeping the street. Lollipop explained to us that this type of pride in their community is ingrained in all Sabans from a young age and it’s just part of the culture now. There is also virtually no crime, as all of the less than 2,000 inhabitants seem to know and support each other. A real community. Saba is challenging to visit by sailboat; one really needs a good weather window. You will either need to stay in Well’s Bay, which is in the lee of the island (not really a bay at all) with an extremely long dinghy ride to the port, or closer to the port which is completely exposed to the easterly trade winds and still a relatively long dinghy ride. The day ferries from St. Maarten are the most popular way to travel to Saba. The last option is flying, but even this comes with challenges as another thing they said could not be done on Saba was to build an airport here. So of course they did. We met a pilot in St. Kitts who described Saba’s airport as like landing on an aircraft carrier. Apparently you are not allowed to land there until you have co-piloted with someone else who has. After our land explorations, we moved Argon from the Port Ford mooring up to one of the mooring balls in Well’s Bay. It was from here that we would depart at midnight for the British Virgin Islands under a moonless but star-filled night. Captain Linda Perry Riera and her husband Captain Bob Damiano are the owners and operators of All Hands Sailing Charters, LLC in Boston, MA (allhandssailing.com). 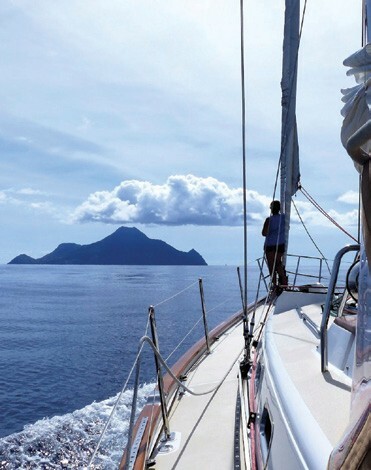 Argon is currently island- and harbor-hopping in the British and U.S. Virgin Islands. You can follow Linda and Bob’s journey (and view their very well produced videos) at ArgonSailing.com. March 2017 Comic – Have You Checked Your Boat?